Offered for sale is an original red vinyl Japanese pressing of Meddle by Pink Floyd, complete with original obi. About this copy: This copy of Meddle is an original 1971 Japanese pressing, pressed on “Everclean” red vinyl and including both the lyric/photo booklet as well as the original obi. While there were seven Pink Floyd albums released on red vinyl in Japan, they’re not all equally rare. Meddle falls in the middle of the pack; it’s scarce, but not impossible to find. The cover is VG, with no major wear, but wear at the edges and corners. A 2″ split at the bottom of the cover has been repaired. The obi is complete and VG+, with a fair amount of foxing. The “hojyuhyo,” or re-order tag, is attached. The lyric/photo booklet is M-. The red vinyl disc is VG+ with a few sleeve scuffs, but no major marks. There are a number of spindle marks on the label. The record has been played a number of times, but has been well cared for. A nice copy of an album that’s quite hard to find as a complete first pressing and the only such copy of this album that we’ve ever had for sale. The album reached #3 on the UK charts, but only reached #70 in the U.S. Due to increased sales after the success of Dark Side of the Moon, the album was eventually certified two times platinum in the U.S.
A single, “One of These Days,” failed to reach the U.S. charts. A still sealed copy of the Brazilian promo-only picture disc edition of Delicate Sound of Thunder by Pink Floyd. Offered for sale is a Japanese red vinyl pressing of the band’s 1969 soundtrack album, More, including both the original obi and a second “tour” obi. About this copy: This copy of More is a 1970 Japanese second issue, pressed on “Everclean” red vinyl, including a Japan-only gatefold cover, and including both the original obi and a second “tour” obi that was added to promote a visit by the band to Japan. The cover is VG++, with traces of wear at the edges. The obi is M- and includes the “hojyuhyo”, or reorder tag. The tour obi is M-. The red vinyl disc is M- and clearly has only been played a few times. There are a few spindle marks on the label, but the disc itself is exceptionally clean. A beautiful copy of a terrific record and the nicest copy we’ve ever offered for sale. Background: The soundtrack to an obscure film, More isn’t high on the list of most Pink Floyd fans’ favorite albums, as it’s a bit more mellow and disjointed than most of their work. It’s also not as well known as their later work; without a single to help sales, the album only reached #153 on the U.S. album charts. Of course, soundtracks tend to be a bit disjointed, as the music is written to go along with the film, not to work as a cohesive whole. Still, there’s a good rocker here, The Nile Song, (which was released as a single in Japan) and a couple of great ballads by David Gilmour: Green is the Colour, and Cymbaline. In fact, More is unique in the Pink Floyd catalog as it’s the only album by the band to feature Gilmour as the only vocalist. As with most albums in Japan, More was released multiple times, with multiple catalog numbers, multiple obis, and on both black and red vinyl. The first issue was pressed on red vinyl and had a single pocket cover and a now-impossibly-hard-to-find “New Rock” obi; the second issue had a gatefold cover and was pressed on both red and black vinyl with a black obi with orange print. Later issues were pressed on black vinyl only and had an obi that was unique to that particular reissue. The first issue is extraordinarily rare and rarely turns up for sale. The second issue, which came out the same year as the first one, was more successful in the Japanese market, but has become much harder to find in recent years, especially in good condition. Offered for sale is a 1971 Japanese second pressing of Pink Floyd’s 1968 LP, A Saucerful of Secrets, pressed on red vinyl and including the original lyric insert and obi. About this copy: This copy of A Saucerful of Secrets is a 1971 second issue, Odeon OP-80282, with the words “Toshiba Musical Industries” on the label. The cover is VG++, with a bit of wear at the corners. The red vinyl record is VG++, with a couple of very faint scuffs and a number of spindle marks on the label. It’s very close to M-. The lyric insert and original obi are included. The obi is VG+ and the “hojyuhyo”, or reorder tag, is still attached. A hard to find pressing of a great album by an iconic band. Background: Pink Floyd’s second album, 1968’s A Saucerful of Secrets, was a transitional one; founder Syd Barrett was on his way out after a series of health and personal problems, and former Joker’s Wild guitarist David Gilmour was brought in to replace him. This is the only album on which all five members of Pink Floyd played; while Gilmour plays on all seven tracks, Barrett plays on only three, providing vocals on the album’s closing track, Jugband Blues. The title track of the album was the first of many long, spacy tracks to come from the band on subsequent albums. 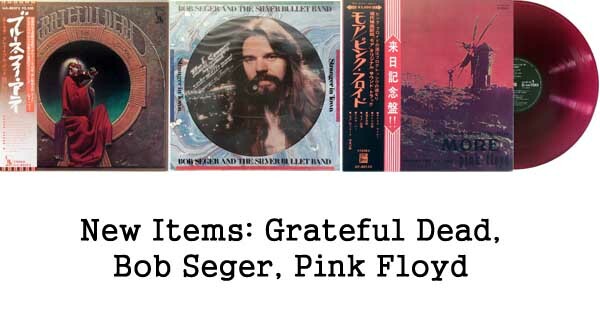 While seven different Pink Floyd albums were released on red “Everclean” vinyl in Japan, some are harder to find than others, and the first three albums were issued on red vinyl twice. A Saucerful of Secrets is one of the harder titles to find on red vinyl. Offered for sale is an original 1994 still sealed blue vinyl U.S. pressing of The Division Bell by Pink Floyd. About this copy: This copy of The Division Bell is an original still sealed U.S. pressing, presumably on blue vinyl, issued in 1994 on Columbia records. As the album is still sealed, the record is presumably new and unplayed. As far as we know all original U.S. issues were blue vinyl, so that is what you should find inside. The shrink wrap is completely intact, with no rips, cuts, holes, or tears. It’s as nice a copy as you could ever hope to find and should be your final upgrade. A terrific copy of an LP that has become quite hard to find in recent years. Background: Released in 1994, The Division Bell was Pink Floyd’s first studio album in seven years and the second without founding member Roger Waters. Despite mixed critical reception, the album reached #1 on the American album charts. The album was released in LP form in both the U.S. and the UK. While the UK pressings were issued on standard black vinyl, the American pressings were available on a translucent light blue vinyl. The LP version of The Division Bell has a playing time of about 8 minutes shorter than the compact disc version, as seven of the eleven songs on the album were shortened for the LP version. 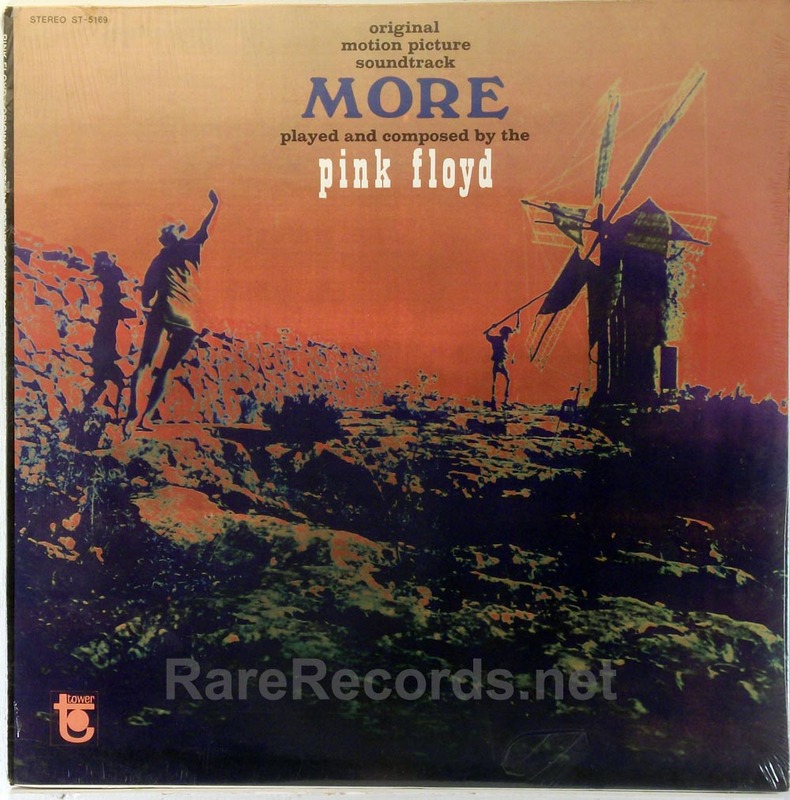 Offered for sale is a still sealed promotional copy of the original pressing of Pink Floyd’s third album, More, issued on the Tower label in 1969. About this copy: This copy of More is an original 1969 pressing on the Tower label. This copy is a still sealed promotional copy. The record is presumably new and unplayed. The back cover has a “DJ” stamp on it that indicates that it is a promotional copy. While this copy is sealed, every copy we’ve ever seen with the “DJ” stamp has included a record with promotional text on the label (see photos.) This one almost certainly has that text (“Promotional – Not for Sale”) as well. The shrink wrap is tight and almost 100% intact. There is a small tear near the bottom right hand corner and a very slight (1/2″ or so) break in the wrap on the spine. There are no other rips or tears in the wrap and the cover has no cutout marks or punch holes. This is a beautiful copy of an underrated LP that has become quite hard to find in good condition in recent years. It’s also the first sealed promotional copy that we’ve seen in about 30 years. Background: Issued in mid-1969, More was ostensibly the soundtrack to an obscure French film that wasn’t widely seen, though the album works well as a Pink Floyd album. It has the distinction of being the only album by the original band not to feature a Roger Waters vocal; all of the vocals on the album were done by David Gilmour. More sold poorly in the United States, reaching only #153 on the Billboard album charts, but it did manage to reach #9 in the UK. While Pink Floyd’s first three albums, The Piper at the Gates of Dawn, A Saucerful of Secrets, and More were released on the Columbia label in the UK, in the United States, they were released by Tower Records, a small subsidiary of Capitol Records that emphasized garage bands and progressive rock. Despite the distribution by Capitol, most albums on Tower sold poorly and were likely hard to find even when they were new. The only two albums on Tower ever to reach the Top 20 in the U.S. were soundtrack albums, leaving albums by Pink Floyd, the Standells, and the Chocoloate Watch Band to be discovered later by collectors. First pressings of More on the Tower label have become quite hard to find in recent years, especially in collectible condition, as the cover was extremely prone to ring wear. While sealed copies of the three albums on Tower used to be somewhat common, they’ve become quite scarce in the last ten years. More was among the last half-dozen titles released by Tower Records before the label shut down in 1970. As such, original pressings are quite hard to find, especially when compared to their later releases. More was eventually reissued in 1973 on the Harvest label. More has the distinction of being one the only Pink Floyd album on Tower to have promotional copies issued with printed promotional labels and one of only two albums by the band (The Wall was the other) to be issued in the U.S. with promotional labels. Promotional copies of the two earlier albums were simply stock copies with holes punched in the upper right hand corner. Promotional copies of More can also be noted by the presence of the letters “DJ” stamped on the back cover. Offered for sale is a still sealed copy of the promo-only single LP picture disc edition of Delicate Sound of Thunder by Pink Floyd, released in Brazil in 1988. About this copy: This copy of Delicate Sound of Thunder is a single-album picture disc edition released in Brazil and issued only as a promotional item. The album was shipped in a thick plastic sleeve with a flap that was sealed shut with a sticker. That sticker is still intact; the record is presumably new and unplayed. A sticker listing the title, catalog number and song titles is attached to the sleeve. A beautiful copy of one of the rarest Pink Floyd picture discs. Background: Released in 1988, Delicate Sound of Thunder was Pink Floyd’s first proper live album (Ummagumma was half live/half studio) and the album documented the tour that followed the release of their 1987 “comeback” LP, Momentary Lapse of Reason. Delicate Sound of Thunder was released worldwide as a two record set. In Brazil, an edited, single LP version of the album was pressed as a picture disc. This disc was not offered for commercial sale but was instead issued only as a promotional item. We don’t know how many copies of this picture disc were pressed, but it was likely only 100 or so. Offered for sale is a rare blue vinyl pressing of Atom Heart Mother by Pink Floyd, issued in France in 1978. About this copy: This copy of Atom Heart Mother is a limited edition blue vinyl pressing, issued in France in 1978 or 1979. The cover is VG+, with slight wear at the edges and a 1″ tear at the top center edge. The record is VG++. It’s very close to M-, but just has a couple of very faint scuffs from being removed from the inner sleeve. A beautiful copy of a rare record and only the second copy that we have ever seen. Background: In the late 1970s, collectors were showing a lot of interest in colored vinyl records, so record companies around the world began issuing limited edition colored vinyl pressings of a few then-new titles as well as some older ones. A few titles were issued in the United States, but far more titles were issued in Europe, mostly for export. Forty years later, some of these titles are fairly common and others are far harder to find. One of the rarer ones is this blue vinyl pressing of Atom Heart Mother by Pink Floyd. The album was never one of the band’s bigger-selling LPs, and the colored vinyl albums from France were not widely exported, making them hard to find even when new. 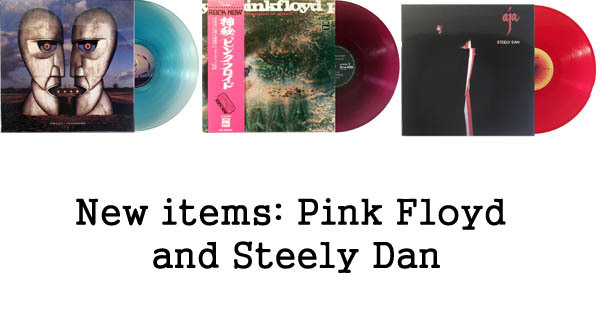 There are also French colored vinyl pressings of Dark Side of the Moon (clear and blue), and Animals (pink.) All are hard to find today. We are not aware of any other colored vinyl pressings of Atom Heart Mother aside from the red vinyl Japanese issue.